As someone who spent months bemoaning how World War Z was guaranteed to be nothing like the book and would thus be terrible, it's time for me to eat crow. World War Z is actually a good movie. Would I have preferred a more faithful adaptation? Absolutely. Does it work despite its rush-to-save-the-world plot being the exact opposite of the book's? Yep. This is a tense, escalating, spectacle-packed zombie movie unlike any the genre has seen before. That doesn't make it the greatest zombie movie ever made, but it certainly makes it a noteworthy one. Brad Pitt is good in it, the supporting cast is even better, and the sense of global urgency and terror is handled quite nicely on top of it all. It's definitely worth checking out, no matter how skeptical you once were. 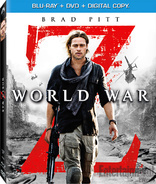 Note: The extended edition of WWZ is only available in 2D. Special Features: A handful of short making-of segments that add up to about 50 minutes of material; "Origins" (eight minutes), a look at how the source material found its way to the big screen; "Looking to Science" (seven minutes), a fluffy about the sorta science behind some of the film's ideas; "WWZ Production" (this is actually its own four-part feature totaling about 36 minutes) that focuses on four of the film's biggest sequences. Sadly, there's nothing about the original ending on here. You can read more about it here, though, and also read why Marc Forster is happier with the version that ended up in theaters. It really is a pity that no major studio would get behind Steven Soderbergh's film about the life and loves of Liberace, but it ending up on HBO is yet another piece of evidence that proves the line in quality between the big and small screen is disappearing more and more every year. If you love performance-driven dramas, you need to make Behind the Candelabra -- showcasing new benchmarks for Michael Douglas and Matt Damon, among many other great supporting players -- a must-see, and probably a must own, to boot. From the shoulda been an art house movie to actual art house movies, this week also sees the release of Sofia Coppola's comedy The Bling Ring, as well as The East, aka the new movie from the writers and director of the terrific Sound of My Voice. Both were met with somewhat lukewarm reception when they hit theaters earlier this year, though it's worth mentioning that the people who did love The Bling Ring really, really loved it. If you're looking for something a bit obscure, you can check out Scenic Route starring Josh Duhamel and Dan Fogler as two old friends whose car breaks down in the middle of nowhere. It's not the most original premise around, and the ending is frustrating, but Duhamel gives a pretty damned good performance that shows off way more of his talent than you've seen from the likes of Transformers or Las Vegas. It seems weird to recommend a movie based entirely on Josh Duhamel, but there you have it. And lastly this week sees the release of A&E's Psycho-inspired series Bates Motel. If you're a Hitchcock purist, the modernization and graphic nature of some of the events is probably going to drive you up the wall, but if you're looking for a twisted, psychosexual TV thriller, it gets the job done and then some.